Presented to His Excellency Sir Winston Churchill. Exactly 73 years ago, on February 1st, 1946, Winston Churchill, one of the most famous statesmen in the world at the time, made his second and final visit to Cuba. Traveling to Havana with his wife Clémentine and his daughter Sarah, he stayed in the República Suite at the Hotel Nacional de Cuba. Unlike his first visit, when he had arrived by sea in a warship, the British chief of state came from Florida by air in an American plane provided by President Truman. Initially, this visit was supposed to be a simple vacation but Churchill’s popularity led him to meet many local celebrities. Thus, shortly after his arrival, the illustrious visitor and a Cuban guest of honor was invited to meet President San Martín. Their talk must have lasted about 20 minutes judging from the photos. "Obsequio de Honorable Presidente de la República de Cuba RAMON GRAU SAN MARTIN en su visita a La Habana (Cuba) 1 de Febrero de 1946 – Al Excelentísimo Sr.WINSTON CHURCHILL"
After his visit to Cuba, Churchill became a strong ambassador of Romeo y Julieta cigars’ excellence. The brand regained popularity as all the aficionados sought the cigar that the so-called "British Bulldog" was so fond of. Moreover, the vitola Julieta No2 (47 x 178 mm) was renamed "Churchill" in his honor. 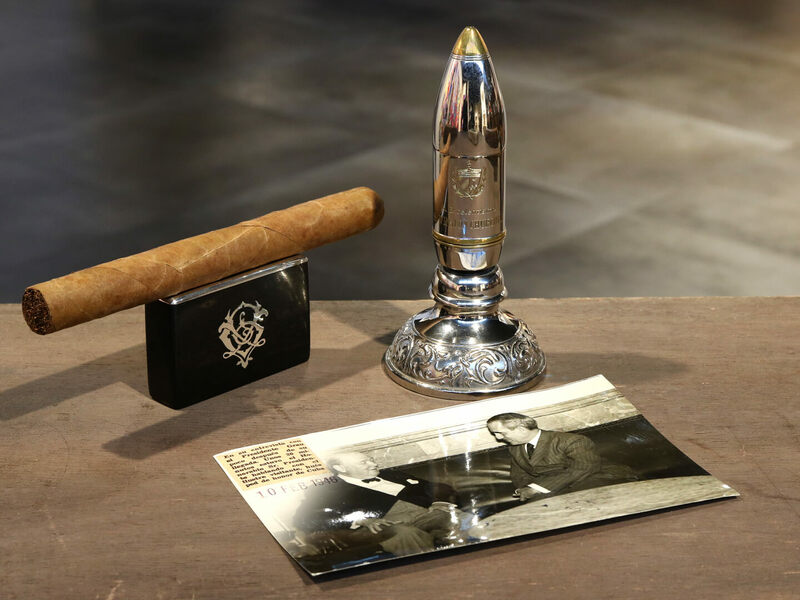 Nowadays Churchill's size is used by hundreds of cigar manufacturers around the world and is still one of the most popular sizes. Ramón Grau San Martín is a Cuban statesman born on September 13th, 1887 in Pinar del Río and died on July 28th, 1969 in Havana. He was President of the Republic of Cuba from 1933 to 1934 and from 1944 to 1948. A SHELL-SHAPED LIGHTER offered by Ramón Grau San Martín to Winston Churchill in 1946.